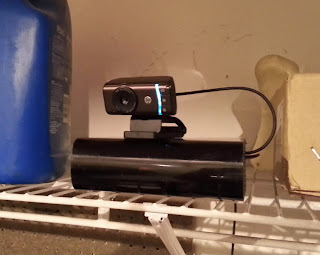 My rinky-dinky garage security system is now online and in operational use. 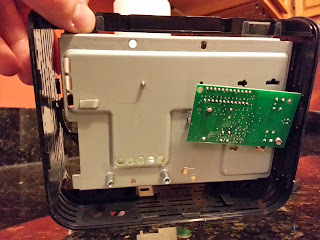 I still have more tweaks to do - for example, I got rid of the metal backplane within the My Book casing that now serves as my board enclosure because it shielded my WiFi signal, killing the network connection. I'm sure I will continue to tweak the Motion configs to increase framerates and decrease sensitivity. Now that e-mail notifications are working, hopefully I can limit the spurious notifications and just notify on the bigger changes of motion over two seconds in length. Another measure of success is cost; if I could have purchased a ready-made setup for a marginal increase in cost, it may be better to go with a commercial platform. If the build is overkill and I could have built it with cheaper components, I should scrap this and re-build. Looking at commercial options I couldn't find anything that had both the garage door functionality and the security camera... just one or the other. Chamberlain does sell the MyQ Garage, a pretty nifty home automation product that contains a universal garage door opener and a tilt sensor that is WiFi-enabled and can be paired with a smartphone app. They also sell the MyQ Internet Connectivity Kit, which is more of an Internet-enabled garage door master controller. Neither have a security camera paired with it, but you could easily install a wireless camera separately for around $40. The MyQ solutions are $140 and $120 respectively, giving you a total build cost of $160-$180. Not bad, really. 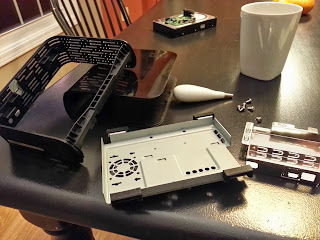 I had most of these parts on-hand, so my actual cost was closer to $70. That means a savings of $90 over a commercial solution. 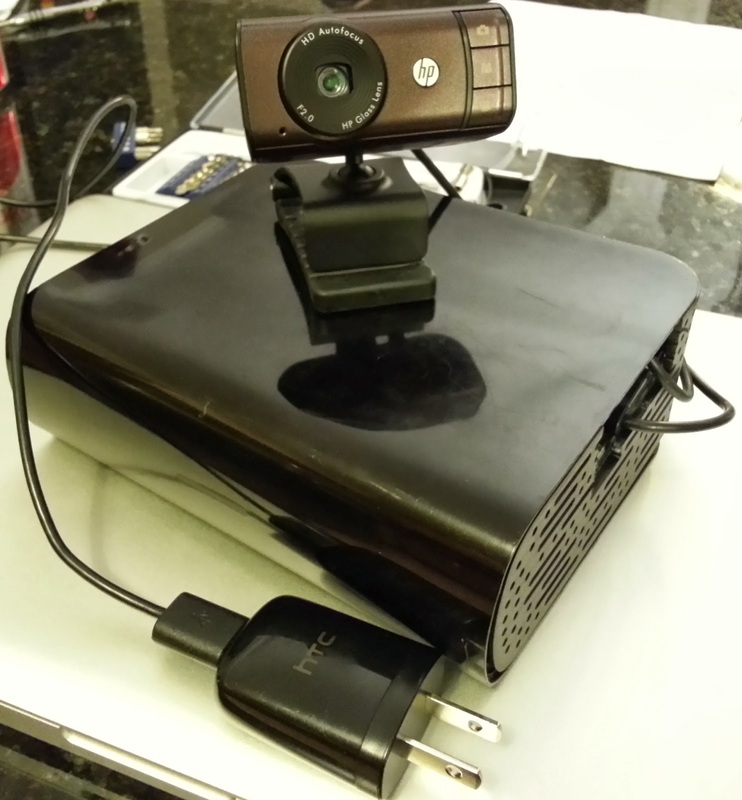 I don't know of a cheaper solution than the Raspberry Pi that could handle a 1280x720 webcam feed and perform motion detection, and a $14 webcam is cheaper than Raspberry Pi's own camera expansion card. All told maybe 12 hours of work, a quarter of which was me figuring out how to render an MJPEG stream on an HTML5 canvas. The web interface can be re-used, as are the system administration steps, so I could probably do another in four hours or so. Four hours and $70 isn't too bad for peace of mind. Speaking of ease of mind, I'll leave this thread with an ad for Chamberlain's MyQ Garage. I thought I was bad... but these actors have turned garage door anxiety into an existential crisis. I'm going to be tinkering with this new security camera / Internet-enabled garage door opener for some time... I imagine I'll add environmental monitoring and perhaps even hook it up to the sprinkler system. Even with future expansion in mind, I needed to shield the Raspberry Pi and the remote control board from dust and stray water. The mini protoboard I would likely keep as opposed to soldering a more permanent board, since I wanted the ability to dork around with the GPIO pins that have pull-down resistors built in and possibly add additional controls. 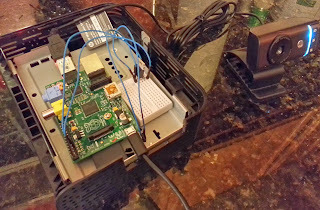 I had an old Western Digital My Book sitting around with a defunct hard drive, and it appeared to be nearly the right size to house the Raspberry Pi, the garage remote board and a mini breadboard. I decided to gut it and use the housing as an enclosure. I found a few motherboard standoffs in my toolbox, and uses those to keep both boards a few centimeters off of the metal backplate. The drive and controller itself I shelved. Once I had everything stripped apart, the garage remote was mounted on one side of the board and the Raspberry Pi was mounted on the other. It was a tight fit, but I was able to get the webcam plugged in, the mini breadboard slid in and all the wiring completed within the confines of an old My Book chassis. Using a very technical device I call a "hacksaw," I removed some of the side wall of the enclosure so I could pull out the micro-usb cable for power and bring the webcam so it can be positioned independently. In the end everything didn't quite fit... the garage remote is bursting out of its seam. However the general look of the device is far better than it was before. The unit is now back sitting on a shelf in the garage, quite content. I still have some continued tweaks to do, but I think I've now addressed the root question: "is the garage door up?"